I was lucky enough to be given this award by the uber talented Helen from Ellephantastic Card and Crafts. She produces the most delightful digi images and I am totally hooked on Roger, a dear little bear who is among her creations. The talented Lizzie Gough, who is doing SO well on 'So you think you can dance', was in my class for a couple of years in infant school when she was 6 and 7 years old. Her mum was my classroom assistant for a while some time later. Make sure you vote for her (Lizzie not her Mum)! I don't like dessicated coconut. My granddaughter aged 19 months can count to 6. (1:1 correspondence ) I was flabberghasted! I passed my driving test first time after having only 6 lessons. I own several etchings by the Kentish artist Graham Clarke. Julia, whose writings on her blog so often make me smile. Clare who produces the most beautiful creations and is a fellow Fabulously Crafty Friend at Cuddly Buddly. Annie, another FCF from Cuddly Buddly and regular commentator on my blog and the producer of stunning creations. Sharon, a member of several DTs and a very helpful and talented crafter whom I have joined on the DT on One Stop Crafts. 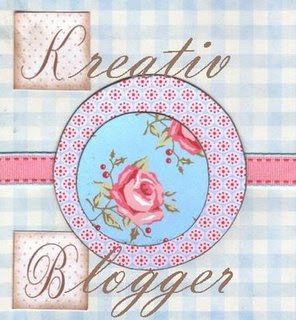 Paula, a frequent visitor to my blog and very helpful crafter. Keryn, a fellow Hampshire crafting resident whom I am looking forward to getting to know a lot better in the near future. Gina, whose wonderful work first came to my notice on the Docraft site and who is now a fellow DT member on the One Stop Crafts Blog. It's a pleasure to have got to know you all...even if it's only in cyber space! Wow! Thank you so much Chrissie. I am really honoured to receive this award from you. I will post this to my blog in the next few days. Congrats of your wonderful award. Gosh Chrissie, how kind of you; very undeserved, but I'll take it, thanks! Hi Chrissie - Thank you sooooo much for this award - i'm really made up that you chose me in your top seven - that really is an honour considering the amount of crafters you know through blogging. I will consider carefully who I pass this onto and what else I reveal about myself!!! I'm impressed at your driving skills BTW - its something I nearly put - but I think I had 8 (I might still put it because there's an added little bonus to me passing test). One Stop Crafts - My Sketch!